Mulan When do wewe think Shang fell in upendo with Mulan ? I think he wasn't interested when she pretended to be a boy, he's not gay. For me , his behaviour before learning she was a girl is directed by pride and respect for the soldier he trained ( Ping was the best in the team). I actually think he fell in love with her after the end of the movie . At the end, he's interested; and then he learned to know her as she really is while she not hiding anything of herself to him. he doesn't need to be gay to fall in love with a boy. i think that when Mulan was still known as Ping, the general began to have feelings for "him", not knowing that "he" is a "she" and when he found out that "he's" a girl, he was finally able to show his feelings. and besides, even if Mulan isn't a "she", they would have still been in love, probably. your brain can't control the feelings in your heart, only deny them. I think he did actually start to have feelings for Ping, but once he found out that she was a girl, he just let himself feel that way. Before he could have been holding back. That also could be that he was proud that he trained her. I agree with fiina. The general had no feeling for Ping rather than friendship and when he found out about he being a girl he fell in love with her. He was only "interested" by Ping after he/she climbed the post and became a good soldier, because he/she was the best warrior. He didn't fall in love with her until the end of the movie. Do you seriously think Disney would create a canonly bisexual main character? Here's what I think: Shang came to trust and respect Ping based on "his" actions (especially the avalanche and the subsequent rescue of Shang), but I think he would have questioned his state of mind if he had truly developed romantic feelings for the person he believed to be Ping. When Ping's true gender was uncovered, Shang was hurt that the "man" he came to trust and respect turned out not to be who "he" claimed to be. Although Shang showed compassion by not killing Mulan, he did throw her aside in the snow-covered mountains, which showed how hurt he felt. This even carried over to subsequent events, when Shang refused to heed Mulan's warning of the looming danger of the surviving enemy forces, and was initially reluctant to participate in Mulan's plan for the final battle. 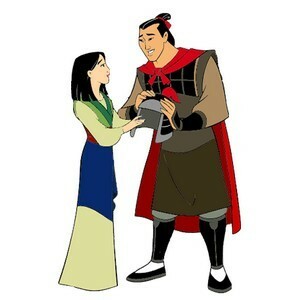 When Shang saw some of the basic elements of Mulan's plan, he decided to lend a helping hand, while noticing how beautiful Mulan looked when dressed in feminine clothing. Then, during the course of the final battle, he noticed that Mulan was still the same selfless, courageous, intelligent, and determined person that she had been while disguised as Ping, which helped restore his trust in Mulan. That, combined with the fact that Mulan was female (and a beautiful one when dressed in appropriate clothing), made Shang fall for her. I don't think he even realised he had feelings for her until the very end of the movie. I think before that he just admired her/"him" a lot. Bewteen These Two, Which Poster Do You Prefer ? Which Gown that don't appear in the movie do you prefer ? Which picture do you prefer ? 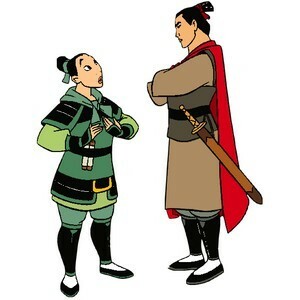 Do you think Mulan comitted herself to the army more to prove that she was able to do it than to save her father ?